While I am carrying on a conversation with someone, I find that I am drawing with my eyes. I find myself observing how his shirt collar comes around from behind his neck and perhaps casts a slight shadow on one side. I observe how the wrinkles in his sleeve form and how his arm may be resting on the edge of the chair. I observe how the features on his face move back and forth in perspective as he rotates his head. 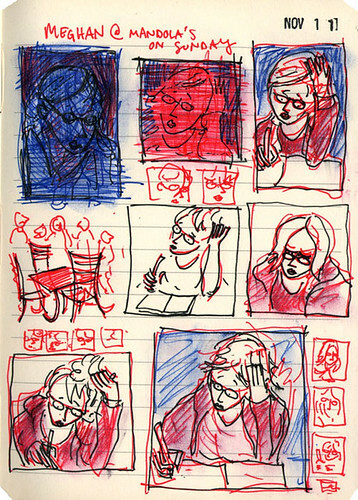 It actually is a form of sketching and I believe that it is the next best thing to drawing itself. I sometimes feel it is obsessive, but at least it accomplishes something for me. While everyone else is reading David Michaelis’s new biography, Schulz and Peanuts, I’ve decided to wait and ask for it for Christmas. Instead, I’m reading Rheta Grimsley Johnson’s underrated and unfortunately out-of-print 1989 “authorized” biography, Good Grief: The Story of Charles M. Schulz. People have called the book “innocuous” and “flattering”, but I think it deals with Schulz’s depression in a very straightforward and explicit manner, and the writing is really great. Worth tracking down. In the beginning, Snoopy actually slept in his doghouse, and a three-quarter view that worked in perspective was the readers’ most familiar angle….The emergence of Snoopy’s doghouse as Grand Device centered not on actual depictions of the humble abode but on allusions to its fantastic contents…the only view the reader is ever given is a left side view. Yet as its graphic depiction became severely restricted, its function became limitless. 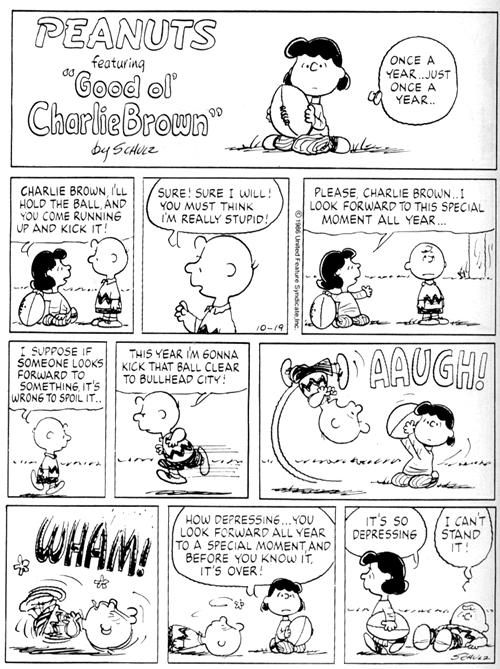 Besides losing, the running (and falling) gag is a pure example of another element that has worked so well for Schulz: repetition…Nothing else in Peanuts is so mechanically repetitious as the football joke….One newspaper editor canceled Peanuts, complaining that the author did the same things over and over. He was forced to reinstate the comic strip, with an apology, when his readers set up a postal howl. Hank Williams’s plaintive ballad “I Can’t Help It If I’m Still In Love With You” spurred the inclusion of the little red-haired girl in Peanuts. After listening to the song over and over again, Schulz was inspired to include in his cast of characters the unrequiting lover….The littler red-haired girl has never been depicted…and he believes she never will be. 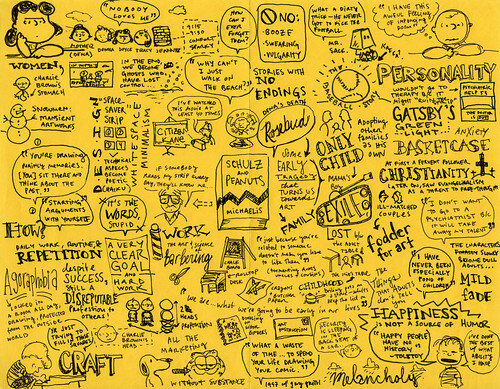 Good cartoon drawing is good design. A lot of people aren’t aware of that. Schulz: I have a combination of strange abilities I can draw pretty well, and i can write pretty well, and i can create pretty well, but I could never be an illustrator. It doesn’t interest me. Rose: That’s because the idea doesn’t come from you? I suppose there’s a melancholy feeling in a lot of cartoonists, because cartooning, like all other humor, comes from bad things happening. People will say, “Well why don’t you have Charlie Brown kick the football?” And I say, “Well, that would be wonderful, it’s happy, but happiness is not funny.” I wish we could all be happy, but it isn’t funny. “I have felt, for some time, a connection between comics and poetry. It’s an obvious connection to anyone who has ever sat down and tried to write a comic strip. 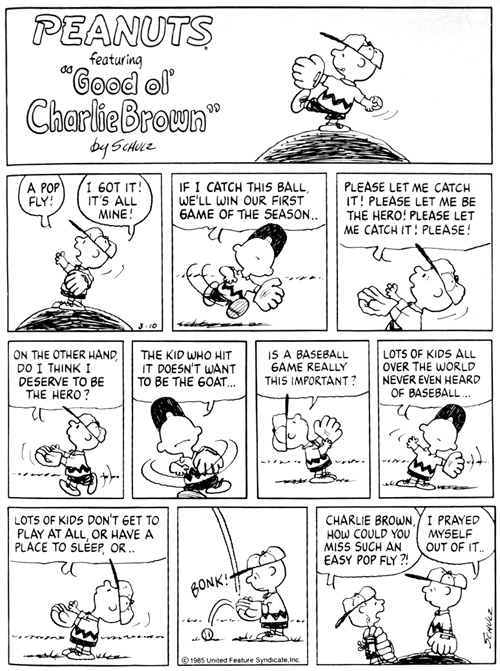 I think the idea first occurred to me way back in the late 80’s when I was studying Charles Schulz’s Peanuts strips. It seemed so clear that his four-panel setup was just like reading a haiku; it had a specific rhythm to how he set up the panels and the dialogue. Three beats: doot doot doot— followed by an infinitesimal pause, and then the final beat: doot. Anyone can recognize this when reading a Peanuts strip. These strips have that sameness of rhythm that haikus have— the haikus mostly ending with a nature reference separated off in the final line. when I am working out a strip. I imagine poets feel this same concern. If you read any free verse poetry you can see how the poet has made certain decisions for how to break the thoughts apart and structure them, often in a way that defies a system. It seems to me that the language of poetry is very dependant on setting up images and juxtaposing them against each other. A poet will create an image in the first two lines of his poem and then he will create another in the next two lines, and so on. I do find this jumping from image to image in poetry to be a very interesting, comic-like element. Many poems are almost like word comics. Comics are often referred to in reference to film and prose — neither seems that appropriate to me. The poetry connection is more appropriate because of both the condensing of words and the emphasis on rhythm. Film and prose use these methods as well, but not in such a condensed and controlled manner. Comic book artists have for a long time connected themselves to film, but in doing so, have reduced their art to being merely a ‘storyboard’ approach. The underlying rhythm seems to have gone unheard for literally decades in the world of commercial comic books (a few noticeable exceptions: Kurtzman, Kirby, Stanley). 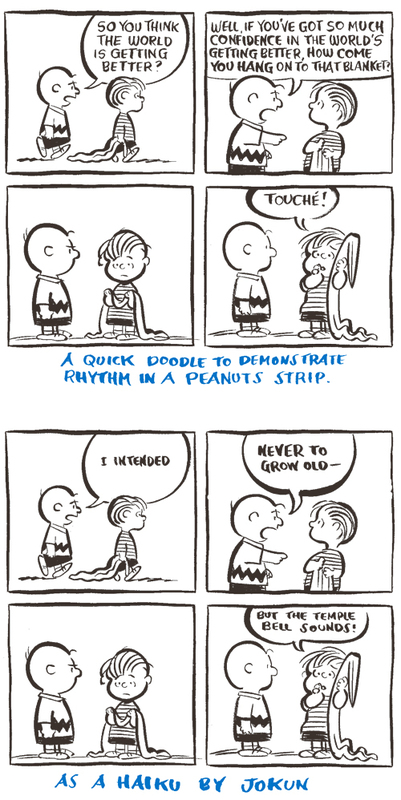 I’ve been on another obsessive Peanuts-reading tear. If you’re interested in listening in to the conversations of one of the greatest geniuses of the 20th century, I highly recommend Charles M. Schulz: Conversations. Particularly wonderful is the 100+ page interview with Gary Groth from 1997 that ran in the Comics Journal. Two things that strike me right this second about the strip. 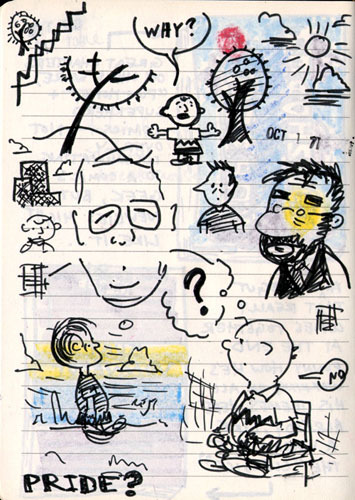 Second, I’ve been thinking about the way in which Schultz’s drawing led his ideas. His formal innovations with his drawing — dressing Snoopy up as a fighter pilot, for instance — led to his character and story development. Schultz made sure to recreate exactly those Beethoven musical scores by hand, and it was the act of drawing — the simple aesthetic pleasure of musical notes in a comic strip — that led to Schroeder. What this means to me is that drawing comics is its own particular brand of alchemy. You can’t just sit down and say, “I’m going to draw a character with a funny nose who has no father and always trips over his shoelaces.” The description means nothing. You have to draw that character into existance. It’s the act, not the idea.